Despite being undefeated this season and the defending national champions, the most interesting thing about the Florida State Seminoles football team is where things stand with Jameis Winston. The head coach, Jimbo Fisher, is getting tired of answering them. Fisher was supposed to give an interview to a few media outlets, but after being asked whether he thinks that his own reputation is being hurt by the situation with Winston, Fisher gave an angry response and cut the interview short. Why is my reputation taking a hit? For backing a kid who has done nothing wrong? I don’t want to get into this. The questions weren’t supposed to be asked today. I’m done. I’m done. The media loves to raise people up and then chew them down. Winston was a darling for a while until the sexual allegation from 2012 came up. Since then, regardless of the facts, it’s been about trying to bash Winston, the university and Fisher himself for letting a young kid get away with what some think is a very serious crime, although nothing has been proven in court. Obviously, both the University and the police could have done a much better job of handling the case, and yet that’s only speculation at this point. Until Winston does something that’s a bit more severe than poaching crab legs and shouting obscenities on campus, it’s wrong to turn him into the biggest villain in college football, even if it does make for a much better headline and gets whoever writes those things about him more clicks. Right now Winston has his university hearing to worry about. While some view it as Florida State trying to fix past errors in the way they handled the situation, the fact that no date has been set makes it seem like this is simply some whitewashing – waiting until the football season ends and by then, Winston will already declare for the NFL draft, making the whole process for the university to seem like it takes such serious allegations seriously (but way too late) won’t really matter at all. Winston had a good game in the 31-27 win over Notre Dame, and is now 20-0 as a start since becoming the quarterback of the Seminoles, winning one national championship and a Heisman trophy along the way. Fisher, his 49 year old head coach, has been at the job since 2010. 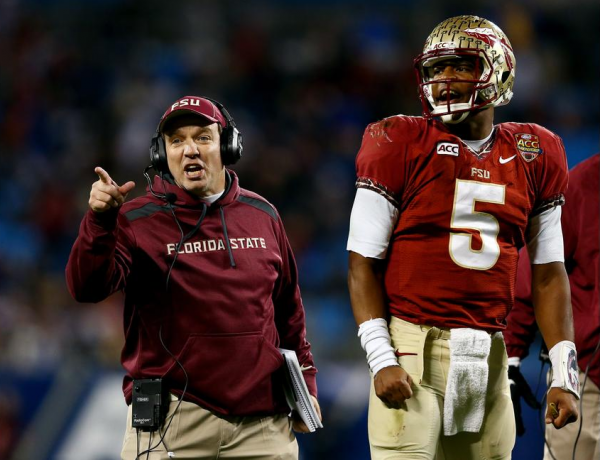 He has a 52-10 record, finishing ranked in all four seasons at Tallahassee, never winning less than nine games. That includes winning the Orange Bowl and the national championship a year later.